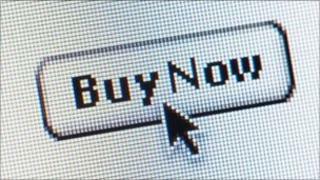 "Pre-ticked" boxes on shopping websites will be banned in European Union states under newly approved legislation. EU ministers meeting in Luxembourg have passed a set of rules aimed at strengthening consumer rights, which the EU parliament backed in June. They mean online traders will have to disclose the total cost of a product - including fees - and customers will have to actively opt-in to extras. Member countries will have two years to implement the rules nationally. Announcing the legislation had been passed, the European Commission cited the example of buying airline tickets online, when customers may have needed to actively decline optional extras such as travel insurance. "With the new directive, pre-ticked boxes will be banned across the European Union," it said in a statement. Customers will also be exempt from any costs of which they were not "properly informed" before placing an order and will be given a 14-day "cooling off" period for withdrawing from a sales contract. The EU's current mandatory period is seven days. Traders will not be allowed to make a profit from the charge levied on customers for using a credit card; those with telephone hotlines will only be allowed to charge customers basic call rates.